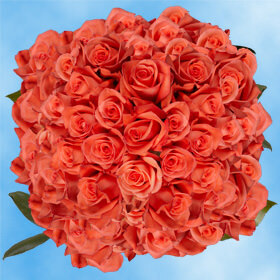 The paparazzi are sure to show up at your next event if you use these salmon colored Movie Star Roses. These shocking buds are sure to cause a stir and by ordering them you would be both smart and wise. If you order through USA, Globalrose, we are sure to provide you with any amount of blossoms you could dream of at prices that are so good you will think you are dreaming! Ordering is easy and fast, so do not hesitate to make a bulk order today. Salmon colored buds are excellent for summer Weddings, New Year's bashes, and Thanksgiving Dinners. All of our products are fresh cut and need a most two to three days to reach their maximum bloom. 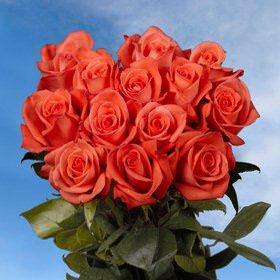 We send all of our roses through FedEx to insure that they get to you on time and in the best possible condition. FedEx also ships them to you at no cost if your order is placed within the continental USA. So order online with USA. Our facilities are on the cutting edge of the flower industry and we spare no expense to make sure our greenhouses are doing whatever they can to get the best of what they need. 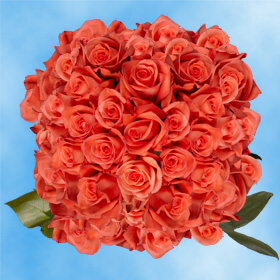 Our facilities are open all year so we can get you the Movie Star Roses you need once you have ordered. 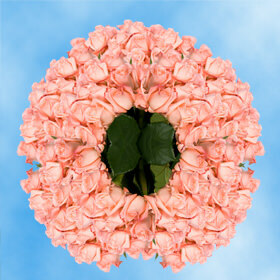 Also, we grow all of our roses in a safe and environmentally friendly way, to help protect Mother Nature.